First of all, you should take some time to objectively evaluate the space you have to work with. To make sure your furniture layout is space-efficient, you will have to consider not only the size, but also the shape of the unit that would be the best fit for your hallway. If the area is narrow, for example, the best way to go would be to stick to narrow high cabinets. Sure, do not forget about the storage capacity you need. This is the primary aspect that will help you define the type of internal racks you should be looking for. Quite logically, summer and winter shoes presuppose different rack distance. Ideally, your cabinet should be designed to accommodate both. Also, take some time to think over which finishes will match your interior picture. 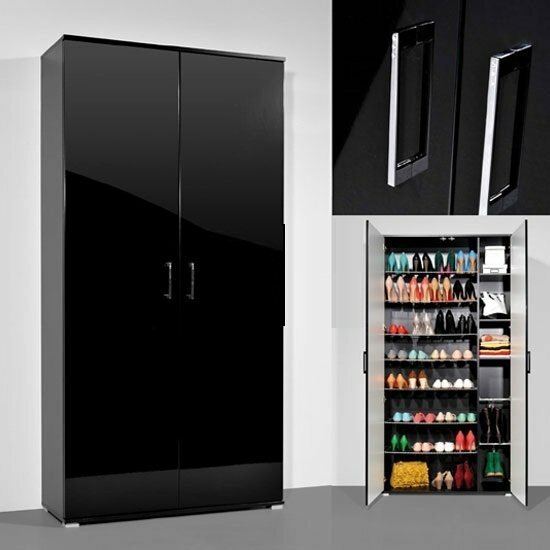 After all, contemporary shoe storage cabinet in black can be painted, tarnished, or lacquered. If your interior is traditional, stick to tarnish and paint. If it is modern, consider going with high gloss finish. Another stylish idea for modern hallways is to go with black glass doors. And, of course, do not forget that black is designed to create contrast. Contemporary shoe storage cabinet in black will look most impressive next to a light wall. Sure, other combinations are also possible, but this one is the definitely the most impressive solution. The most important tip while choosing furniture is to pay attention to quality. Consider not only material durability, but also build and assembly — they are equally important. And, of course, check if the unit is equipped with retarder system and other functional perks. Those are some of the most important tips you should bear in mind while looking for a contemporary shoe storage cabinet — black, white or the one with natural wood shade. If you follow these guidelines, you will definitely find a model worth paying for. And, of course, do not forget that even though high quality furniture can often be quite pricy, there are several stores that feature moderate prices even on highest quality products. In the UK, Furniture in Fashion is definitely one of such platforms. This local store keeps its prices quite moderate, while at the same time offering only high quality furniture from leading local and international manufacturers. The major reasons of shopping with this site are vast product selection, generous discounts, and quick delivery times. A shoe storage cabinet, normally being a compact purchase, will be delivered to any part of the kingdom within three business days.